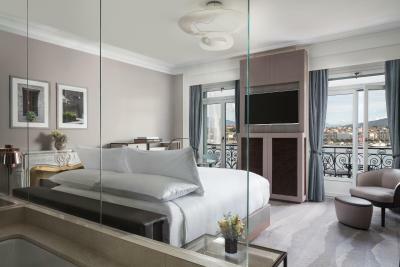 Lock in a great price for The Ritz-Carlton Hotel de la Paix, Geneva – rated 9.2 by recent guests! 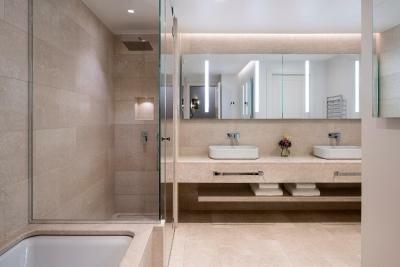 The feel of an intimate boutique hotel with all the services you’d expect from a Ritz Carlton. Fiskebar in hotel is pricy but a 5 star eating experience. The rooms are very clean and comfortable. The furnishings and equipment are top notch. The courtyard-facing room is reasonably quiet. Personalized greetings, offered chocolates upon arrival and colouring books for the kids. The establishment really tries to satisfy the little ones, which also make the adults satisfied. Location is great .. view is stunning.. staff OMG I've traveled a lot round the world many countries all over Europe and United States and Canada and Dubai but I've never seen a start like this group ... The hotel manager was welcoming us at the restaurant for the breakfast .. every day . The pay attention to small details. Gifts were given to my four year old son . Everyone there was a reason we enjoyed our visit to Geneva . Thank you Ritz Carlton. Loved everything about the property. Will be my only stay in Geneva from now on. Perfect , Perfect , Perfect !! ,, I wish if I had done the membership subscription , however I left on a hurry , We loved the outstanding service the staff provided , Amazing concierge ! MUST COME AGAIN !! The service was great. As was the location. Good experience overall. 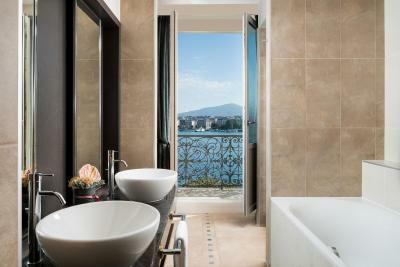 We stayed in a fantastic suite with views of the lake, incredible experience, although pretty expensive - but worth it. Very good staff who helped entertain the kids and were always there to support with whatever. Great architecture of the old building which has been recently renovated, we were impressed! 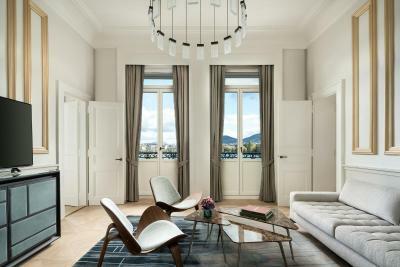 The Ritz-Carlton Hotel de la Paix, Geneva This rating is a reflection of how the property compares to the industry standard when it comes to price, facilities and services available. It's based on a self-evaluation by the property. Use this rating to help choose your stay! 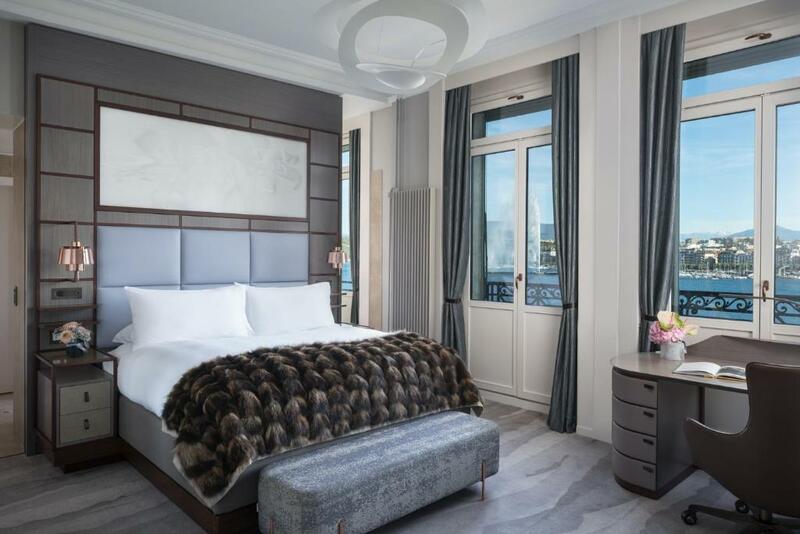 One of our top picks in Geneva.Completely renovated in 2017, the historic and prestigious The Ritz-Carlton Hotel de la Paix, Geneva is located in the heart of the city, on the shore of Lake Geneva. 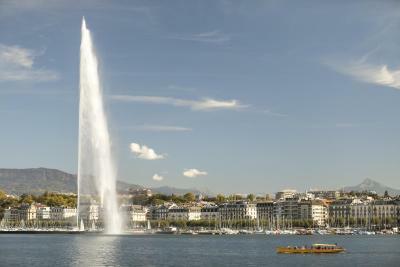 Geneva's old town and the main city attractions are only a 5-minute walk away. 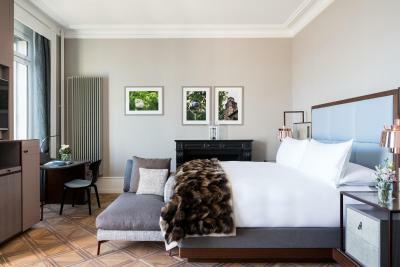 Decorated with luxurious fabrics, the spacious, elegant and comfortable rooms and suites are air-conditioned and feature a mini-bar, an Illy coffee machine, free Wi-Fi and Asprey toiletries. 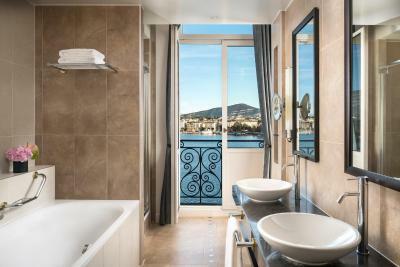 All rooms offer views of the lake or the Montblanc Square. The Living Room Bar & Kitchen restaurant serves international fusion cuisine made with local products all day. The Fiskebar offers a new Nordic inspired cuisine concept. 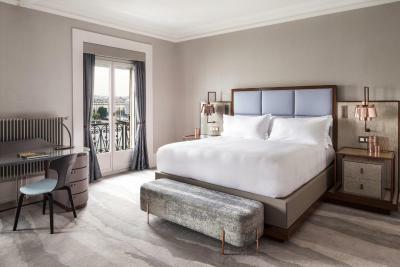 A fitness center with the latest equipment is available, and valet parking and 24-hour room service are featured at The Ritz-Carlton Hotel de la Paix. 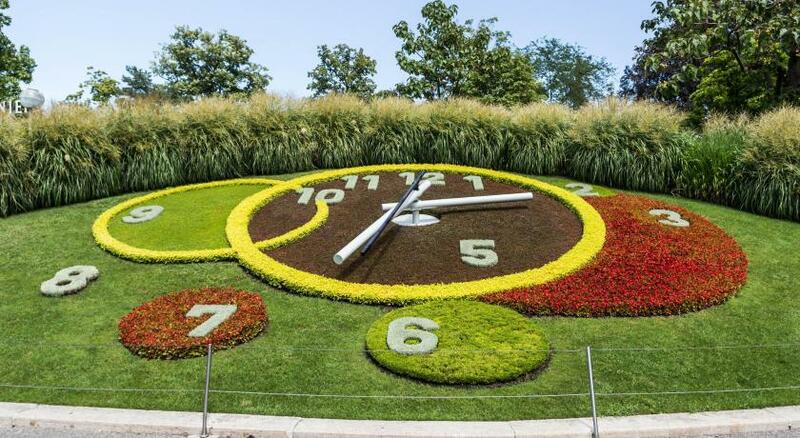 Cornavin Train Station is a 7-minute walk away from Hotel de la Paix. Saint-Gervais / des Grottes is a great choice for travelers interested in old-town exploration, walking and cleanliness. 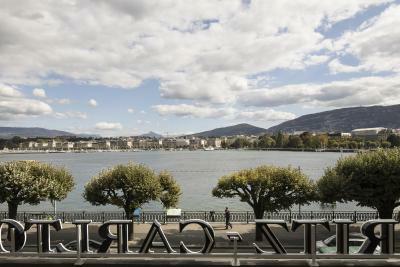 This is our guests' favorite part of Geneva, according to independent reviews. This property also has one of the top-rated locations in Geneva! Guests are happier about it compared to other properties in the area. 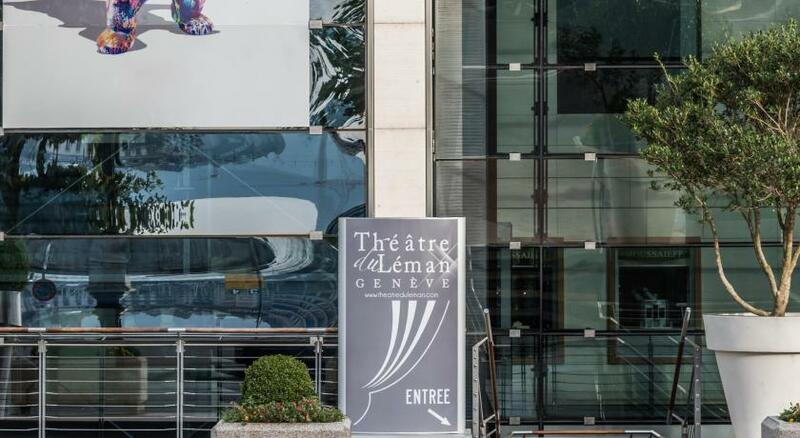 This property is also rated for the best value in Geneva! Guests are getting more for their money when compared to other properties in this city. 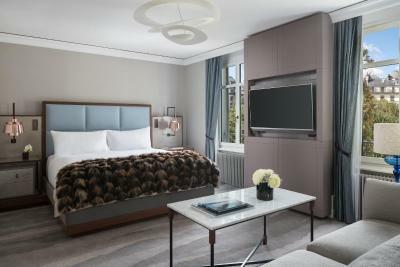 When would you like to stay at The Ritz-Carlton Hotel de la Paix, Geneva? 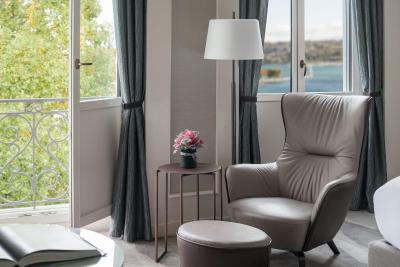 This uniquely designed, spacious suite offers views of Lake Geneva and Mont Blanc. It features a living room with a sofa bed, a bar and a guest toilet, a walk-in closet, a desk and a bathroom with shower and bathtub. 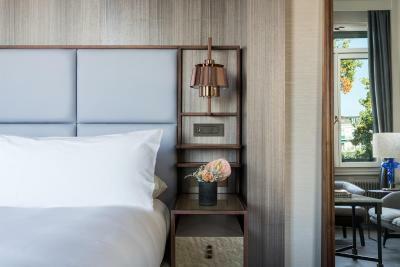 The suite can be connected to a double room upon request. Private parking is available on site (reservation is not needed) and costs CHF 50 per day. This room overlooks the garden and features a desk and a bathroom with a bathtub. 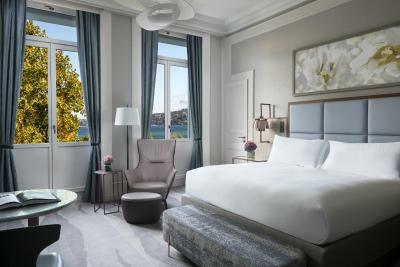 This spacious room offers panoramic views of Lake Geneva, Mont Blanc and Brunswick garden. It was recently renovated with a contemporary design and features a seating area, a desk, and a bathroom with shower and bathtub. 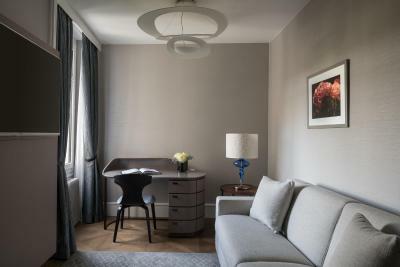 The suite can be connected with a Deluxe Room upon request. 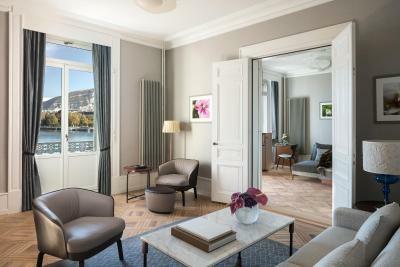 Overlooking the garden, this very spacious room includes a seating area, a desk, and a bathroom with shower and bathtub. 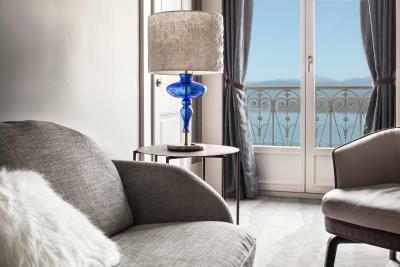 This room offers views of the lake and Mont Blanc and has 2 windows with balconies. It was recently renovated with a contemporary design and features a seating area, a desk, and a bathroom with shower and bathtub. 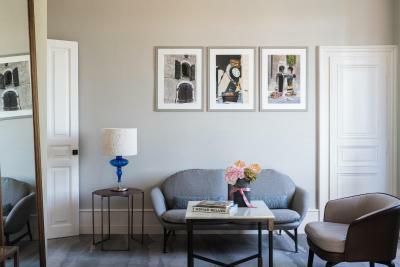 This room can be connected to a One Bedroom Suite upon request. 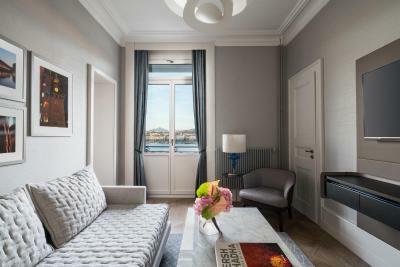 This spacious room offers views of Brunswick Garden and partial lake views. 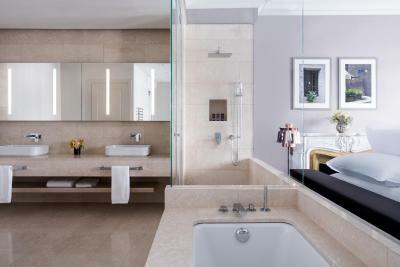 It was recently renovated with a contemporary design and features a seating area, a desk, and a bathroom with shower and bathtub. 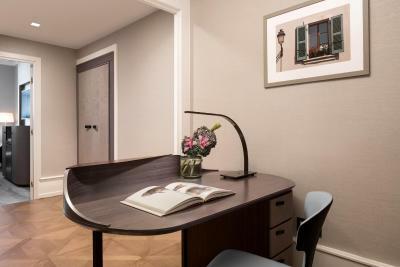 Connecting rooms of the same category are available upon request. Hotel surroundings – This neighborhood is a great choice for travelers interested in old-town exploration, walking and cleanliness – Check location Excellent location – show map Guests loved walking around the neighborhood! House Rules The Ritz-Carlton Hotel de la Paix, Geneva takes special requests – add in the next step! 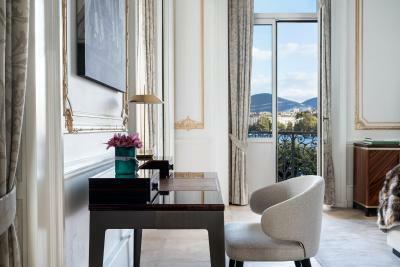 The Ritz-Carlton Hotel de la Paix, Geneva accepts these cards and reserves the right to temporarily hold an amount prior to arrival. Please note that all rooms at the property are nonsmoking. 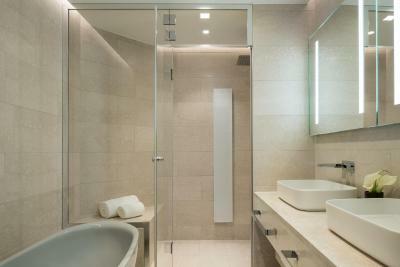 Guests not complying to this rule may be charged up to CHF 400-900 for deep cleaning. Please note that only 1 dog of max. 11 kg is allowed. 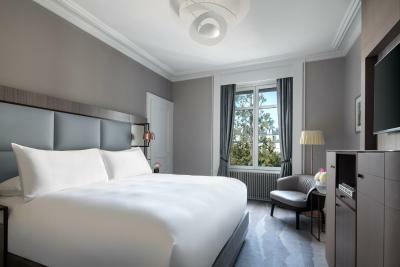 Guests not complying to this rule may be charged up to CHF 250 for deep cleaning. 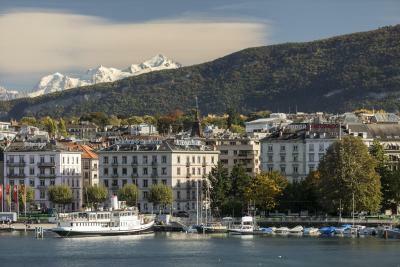 One of the most picturesque neighborhoods in Geneva! 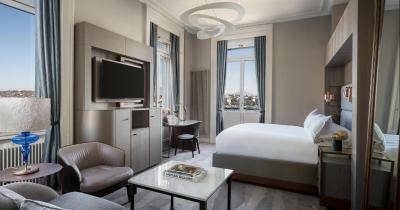 It’s a retrofit if the old Hotel de la Paix so room noise and crosstalk is higher than you would expect of a more modern hotel. If you are not quiet your neighbors will here you. Also the room service menu is dismal. Uber Eats In Minot North Dakota has them beat. One of the main dishes during dinner in the hotel restaurant was really below expectations, would try one of the nearby restaurants nearby, next time. The staff were fabulous. Friendly and helpful. The lack of seating, and maybe a small table to put your drinks on, in the room. The staff were fabulous, keep it up! The location. 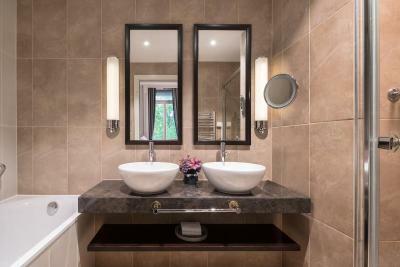 The spacious bathroom with floor heating. The property is an average one with nothing remarkable about it and really disappointing for a Ritz. I stayed in the garden view suite and it was absolutely amazing. The room was one of the biggest and enjoyable rooms in the city for such a low price which was very surprising. 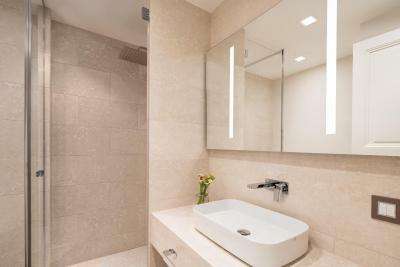 The room was very spacious, had great TVs that were connected to Apple TV which allowed me to stream what I wanted from my device and the best part was the splendid bathroom that had cool lighting machine. i really wonder as 5 stars hotel for the breakfast, very poor..
stuff was great, helpful, comfort was great the bed was amazing..
Breakfast was not included in the price of the room, which was unfortunate. Great staff, extra caring and warm, welcoming. Special surprise organized for the birthday day, with flowers etc. Nothing like the service recently experienced at other hotels. The Jet d'eau was not working, which I was looking forward to seeing. But that was not the hotels fault obviously !